Mangalor, Sep 10, 2014. 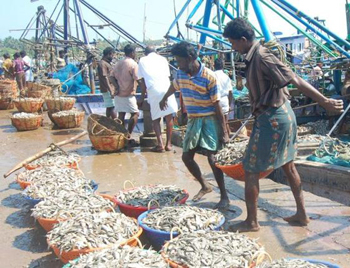 The Fisheries department has introduced various schemes for the fishermen : For SC, the Fisheries department will give subsidy upto Rs 25,000 for construction of Fibre Reinforced Plastic (FRP) boats. Seven persons can avail the benefit. To purchase four-wheelers, the department would provide financial assistance upto Rs 5.50 lakh with 80 pc subsidy (Rs 4.40 lakh). Three fishermen can avail the benefit. For FRB gillnet boats, the department would provide financial assistance to five beneficiaries upto Rs 5 lakh with 90 pc subsidy (Rs 4.50 lakh subsidy). Under ‘Matsyashraya Vasati Yojane’, for the construction of houses, the department would provide financial assistance upto Rs 1.20 lakh with 100 pc subsidy. For ST, the department would give financial assistance upto Rs 5.50 lakh with 80 pc subsidy (Rs 4.40 lakh) to purchase four-wheelers, said Fisheries Department First Division Assistant Ravi Kumar to Deccan Herald . For information contact Fisheries department at 08242459317, 2451292 or 2425680.